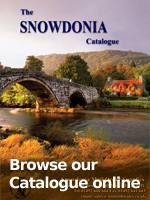 The Snowdonia Catalogue store uses our credit card merchant partners Sage Pay to safely encrypt your credit card information. Sage Pay provides secure online credit card and debit card payment solutions for thousands of online and mail order businesses across the UK. Sage Pay has achieved the highest level of compliance under the Payment Card Industry Data Security Standard (PCI). They adhere to the most stringent levels of fraud screening, ensuring that your details remain secure throughout the transaction process. Their information encryption is unbreakable and it means that your credit card information will not be read by anyone other than you and Sage Pay. Sage Pay can then process your credit card number and even The Snowdonia Catalogue can not access your card information. At no time is your information stored on this web site in any manner whatsoever. Still not happy to use your credit card online? We understand that you may be unwilling to ever use your credit card on a website. If you would like to pay by cheque or bank transfer then feel free to order as normal on this website and we can arrange payment afterwards.